The FBI and the Department of Justice (DOJ) released an unredacted transcript of the Orlando shooter’s phone conversations with police on the night of the massacre after facing backlash for leaving out the gunman’s references to the Islamic State in an earlier version of the transcript. “We have re-issued the complete transcript to include these references in order to provide the highest level of transparency possible under the circumstances,” the DOJ said in a statement released on Monday afternoon. US Attorney General Loretta Lynch told NBC’s Chuck Todd on Sunday that the transcript would be “partial” and omit the group’s name. 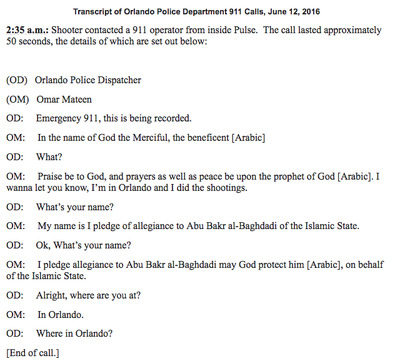 But critics were quick to accuse the FBI of trying to downplay Mateen’s sympathies for the extremist group by omitting its name from the transcript. 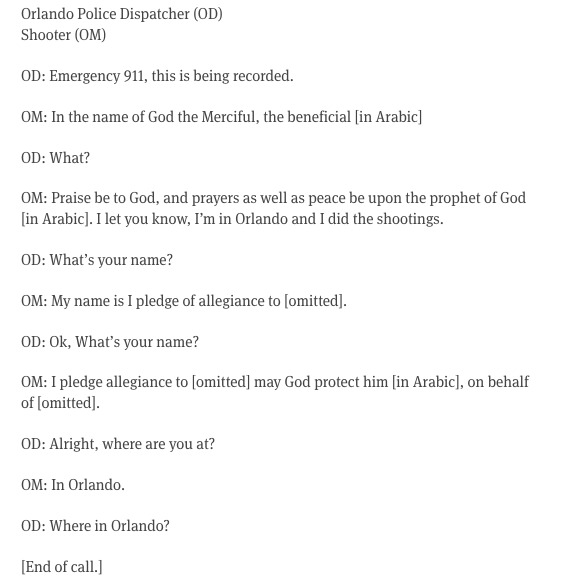 The gunman, who has since been identified as 29-year-old Omar Mateen, spoke to a 911 dispatcher and crisis negotiators as he carried out his attack on the Orlando nightclub Pulse on June 12, which left 49 people dead and more than 50 others wounded. In those calls, he pledged allegiance to the Islamic State and to its leader, Abu Bakr al-Baghdadi, FBI director James Comey confirmed in a press conference last week. In the transcript released Monday, however, Mateen is referred to as “OM,” and any mentions of ISIS are omitted. Ultimately, however, “the unreleased portions of the transcript that named the terrorist organisations and leaders have caused an unnecessary distraction from the hard work that the FBI and our law enforcement partners have been doing to investigate this heinous crime,” the statement read.